Even the things she got wrong (such as the denomination’s name, as above), and the lack of nuance about Mennonitism and its diversity, could be assumed as creative inattention or conflation for her non-Mennonite audience and a comedic genre. Besides, this never quite seemed a memoir of going home to the Mennonites as much as a memoir of getting over the marriage. And if being with the folks and writing in a “hideous red fur robe” made by her mother — a garment so unlike those of her previous sophisticated married life — was Mennonite in some respect, the important thing is, it was good for her. It helped! But I didn’t like the humour when it felt mean. Janzen writes a chapter on “wounding words” she experienced but she delivers more than a few herself throughout the book, it seemed to me, especially about identifiable members of her family. I first realized I might land on the opposite of the author’s jokes now and then when I found myself sticking up for the senior Mrs. Janzen in an (admittedly) odd conversation between daughter and mother. “She will follow you anywhere, conversationally speaking,” Janzen reveals, and then sets her mother up for further folly. Perhaps I’m being generationally sensitive, but isn’t this what mothers do — follow their children around, conversationally? Shirley Showalter, in a great review essay of the book here, calls the portrait of Janzen’s mother, Mary, “brilliant.” She’s “so ego-free and so unconcerned about normal barriers between public and private life that we, too, can relax,” she writes, “and enjoy the…earth-mother love.” I confess I felt more ambivalent, however, than relaxed. Would she really not mind having the silliest of her conversations published, really not mind having her head described as “sprouting directly from her shoulders like a friendly lettuce” because she has no neck? (As for Mother Janzen’s flatulence, I’d say: leave it for the crone lit writers). I couldn’t help wondering if there wasn’t a mirroring of acquiescence to insult here, expressed by both mother and daughter in different ways. “My future”? When I paged back through the book I could trace hints of the narrative arc, yes, towards this acceptance of her heritage. But they had registered too quietly beside the much stronger tone of the humourous, or mocking, justifications for rejecting it. I simply hadn’t expected such a cheerful conclusion. In an interview at TIME, Janzen says of her return that it’s no surprise she loved her parents, for she remembered them as “congenial folks” but she was surprised that she “loved what they stood for – I loved the faith itself, and the way they consistently demonstrated what they believed.” But this was not the book’s abiding impression on me. The reason, I think, is the inconsistency, unevenness, in tone, which an editor should have caught. Last daisy petal standing: I liked that Rhoda Janzen went “home,” that she gave this story a go. I’m glad, for her sake, that she’s sold a lot of books. I’m also glad that her foray into memoir, or chick lit, whatever it may be, has provoked useful discussion about how we could, or should, be telling our stories. For further reading about the controversy around this book, and about Janzen’s forthcoming book, see: “Memoir of going home is acclaimed, critiqued” and “‘Mennonite’ author pens second book,” both at Mennonite Weekly Review. 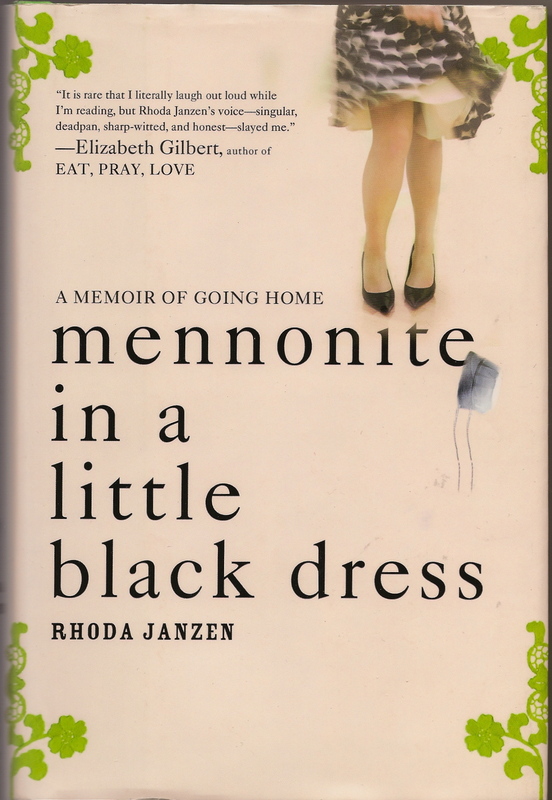 This entry was posted in Books, Mennnonite Brethren, Mennonite, Writing and tagged Center for Mennonite Writing, Edmund Janzen, Mennonite in a Little Black Dress, Rhoda Janzen, Shirley Showalter, Valerie Weaver-Zercher by doradueck. Bookmark the permalink. Thanks, Dora, for this insightful critique. You have included some issues that other reviewers did not mention and that are worth contemplating. Also, thanks for linking to my review of this book above. I have been amazed by the variety of responses and issues that have poured in from readers in both Canada and the U.S. We can all thank Rhoda Janzen for stimulating a lively conversation! Thanks, Shirley, for your kind words. I agree, we can all thank Rhoda Janzen. She may not have imagined sparking so much conversation. I wonder if she tries to keep up with it herself, and how it has affected the writing of her second book. — And thanks to you too for your words at “About.” I’ve been reading at your site; more about that later. I enjoyed reading your review on the book. I like that you read the book, even if it isn’t your usual kind of literature. Your review made me curious of reading the book for myself, but I guess it won’t be coming to the Filadelfia library soon. Hi Brenda, good to hear from you! I’ll send you my copy if I can persuade the next travellers (H & A?) to Paraguay to bring it along to you. If they have room, that is. Just before reading your interesting review, I posted a comment on Shirley’s web page asking how Mennonite Brethren felt about Janzen not using the word “Brethren” when she described her background. Since you admit to being Mennonite Brethren your review has given be at least one response to that question. It’s been my observation that most of us from MC USA background wish the Brethren word had been included so we could escape being pricked by Janzen’s barbs aimed at her religious history. If there are other MBs who have read Janzen’s book, they may be able to weigh in on your question as well. For myself, there was so much else going on in the book that “bothered” me, in the sense of taking up my notice, the Mennonite piece of it, be it MB or otherwise, seemed there mostly for comic relief, but rather superficially at that, and perhaps I just didn’t take it all that seriously. When you stop to think about it, though, she could have had a heyday with the word “brethren” if she’d wanted to be more specific, so it’s interesting that she kept the identification generic. — The comments after Shirley Showalter’s review on her web page are fascinating, indeed, especially with some of Rhoda Janzen’s siblings weighing in, expressing quite openly their hurt about the book. So I invite readers who are interested to check those out (at the link in the post above), as well as your review, Clif. Incidentally, I noticed you’re about to review Katie Funk Wiebe’s latest book, another — and in terms of representation — far more credible engagement with the MB branch of Mennonites. I was pleased to read KFW’s book for a cover blurb but want to re-read it and say more on that book here as well. Later! I’m still reading KFW’s book and editing my review as I progress. Thanks, Tante Dora! I’d appreciate that. Gerhard and Tina Duerksen are coming next month, I think. I stumbled on this book browsing a bookstore in Hawaii [it seemed fitting, somehow] and read it without any preconceptions. I track fairly well with your loves and not loves. The parallels and juxtapositions to Miriam Toews keep me intrigued. We Mennonites are a peculiar people and invoke an interesting mix of love and loathing for the communities that launch us. Maybe that is what these 2 women capture best. Hi James, Hawaii seems very fitting, indeed, for such a read! Thanks for your comments — I’ve heard others note the Miriam Toews parallels too. Maybe the topic of one of your upcoming columns in the MB Herald? You heard it here first 🙂 I also happened to be reading a draft of a soon to be published book by Stuart Murray of the English/Irish Anabaptist Network, called, The Naked Anabaptist. That was also a fascinating happenstance that is too good to pass. One a journey of discovery from the outside- the other a journey of discovery from the inside. James, this is good news, and a book I’ll be watching for with great interest. Who’s the publisher and when will it be released? Clif, there’s going to be a lot of interest in the Janzen sequel, that’s for sure, at least among those who read the first. I was asked to read Murray’s book for a cover blurb as well. It’s dates are- winter in the U.K. by Paternoster and in the spring in the U.S. by Herald Press.